● Save output file to user input location. ● Time Output type (3options) ** May add specific ranges later. 1. 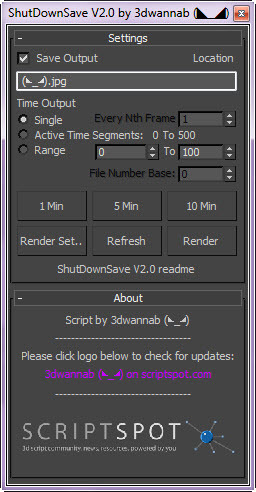 Install using the ShutDownSave_VX.X_by_3dwannab.mzp installer (Drag this into 3ds Max window or run this file). 2. To get a toolbar for it go to: Customize -> Customize User Interface -> Toolbars Category: '3dwannab' and drag 'ShutDownSave (◣_◢)' to a toolbar. 3. Have your render set up ready to go. ● 1, 5 and 10 minutes after the render has completed to let your computer cool down depending on the severity of the time taken to render. 5. Click an option above. 6. Gives you the option to save the file. 7. It set-up a script to turn of your machine with the giving options above for you. 8. Saves the maxfile after rendering with the suffix '_ShutDownSave' so you know approx how long the render took when comparing the two saved files without the need of a stamp on your render. 9. Shuts-off machine when time option selected has been reached with the HiddenDOSCommand and forces all applications to close but enables a planned shut down by the user so you get no wanted unplanned ones on your system. 10. Gives one final warning/option to stop or continue the planned shutdown if you so wish. ● I would advise to save your work and close other applications before going to bed and leave only 3ds Max running. ● TESTED AND WORKS IN MAX 2014, WIN7X64 (I'm sure older versions will not have a problem) but at the very worst v2010 and up. ● HiddenDOSCommands are being sent from this script to the computer, these are harmless and will not affect your work. Submitted by Custom on Sun, 2015-07-05 07:42. Very helpful. I found that it works also good without beeping(with deleted 3dwannab). Submitted by 3dwannab on Fri, 2015-07-03 15:58. FYI. Here's part of the the mzp.run file that's inside the .mzp file which automatically copy's all files to relevant locations. You can see locations here. So to find locations for usermacros type getDir #usermacros for example in the listener and hit return. Do this for the remaining. That folder your referring to is a system folder and not part of max so I placed it there. This is to make a beep sound when the render has stopped. Submitted by Custom on Fri, 2015-07-03 13:09. Thank you for such a quick response! Next time I have surmised to run MAX as admin and everything was fine. I usually transfer settings-preferences-scripts(ESPECIALLY) between my machines by lazy copying these entire folders and now I see there is one(?) more for the "party". Submitted by 3dwannab on Sun, 2015-06-28 13:52. Try creating a folder called 3dwannab in: C:\Windows\ and try again. Basically it copys the xmplay folder inside the mzp file to that location. Submitted by Custom on Sun, 2015-06-28 12:46. Submitted by 3dwannab on Sat, 2014-05-24 16:39. Submitted by Univerpix Studio on Sat, 2014-05-24 16:26.